For club players. The program includes 224 theoretical tactical weapons and 291 practical exercises, which are classified by tactical methods and motifs. In each theme exercises are given in order of rising difficulty to help in the learning process. When studying each theme step by step, you can master all the tactical methods and improve your play drastically. You get plenty of feedback and opportunity to track your progress. The positions are categorized by theme, such as discovered attack, line clearance, intermediate blow, exploiting a pin, playing for stalemate, etc. (25 themes). You can choose the number of positions in the tests, as well as the material covered. 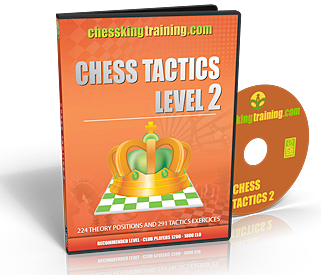 Ideal for chess parents who want their kids and students to improve at chess fast.